Frugal and Thankful: Food waste and a menu, week 4/14-4/20. Food waste and a menu, week 4/14-4/20. First, I want to thank each and every one of you who stopped by here yesterday with your kindest comments about my Mom. I seriously have the best blogo-friends in the world!! We are all excited for her progress and so thankful for it. Thank you, guys, for your sweet wishes and prayers! We grilled zucchinis last week but this one, I think, was already going bad when I bought it. I'm not sure how I missed it but, hey, it happens. We also had a bad mango in a bag that I forgot to take a picture of. And what's on your menu? This picture actually scared me a little until I figured out what they were. You reminded me that I have zucchini I need to cook. Thanks. Potatoes seem to find that sort of fate at my parents' house, since we're not potato people (plantains is more of our thing). 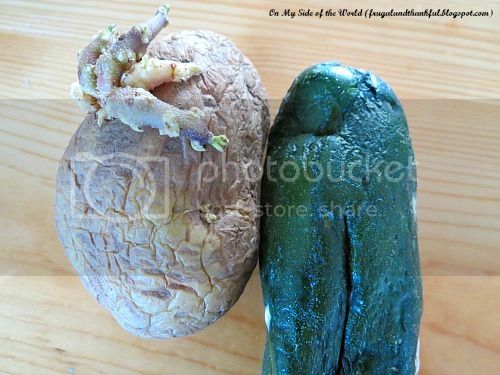 So I can relate to that lonely potato that nobody really knew what to do with... I didn't know what the green thing was, though! Very strange looking. Your menu sounds really good!